Onstage Atlanta presents the absurdist melodrama about a Gotham-like city in the midst of a drought so devastating that the public must pay to pee. OK, so I�m not a big fan of musicals; especially the low budget, low talent, usually off-key variety put forth by so many community theatres. So after reading the many glowing comments on this site about this show, I decided to go check it out. I brought along all my prejudices: the bulk of the reviews here seemed to be written by kids who were friends of the cast; I�ve never been to the venue before (and it�s all the way across town); anyway, what kind of a show is called Urinetown? And man oh man did I enjoy the show! Actually �enjoy� is too mild a word for this production. I was so entertained, so enthralled, so enthusiastic that it wore me out by the end of the performance! I know that every reviewer here has given this show a �5�, but I feel that isn�t high enough. This was the single most solid community theater musical production I have ever seen! This production would shame many of those I�ve seen at the Fox! This one has it all: great talent, great stage direction, great musical direction, great choreography, great staging, great music and a great book! Every single member of the cast is incredibly talented, right on down to the lowliest supporting member. The leads are not just superb, they are exquisite!. The supporting cast members are more than competent; they are all skilled and talented enough to be the leads! Even though I truly feel the entire cast was absolutely incredible, I would like to mention a few standouts: Jenna Edmonds, Eric McNaughton and Robert Wayne. When being hit with the blinding light of such a talented cast, it is often hard to see any individual performances, but these folks made a special impression on me. My highest praise is for the directorial team: director Greg Poulos , musical director Clay Causey and choreographer Ricardo Aponte. This triumvirate of incredible talent paid close attention to every detail in the show. Every actor, every movement, every word, every set piece served a purpose. There was no fluff, no waste no �getting by� or settling about anything. Even though they were blessed with an extremely talented cast, I think these guys could have made a success of this show even if they had been forced to cast the janitorial staff of the local Taco Bell. It was also very obvious that everybody associated with this production worked their butts off. All that effort really showed in the performance. Just so I don�t sound like another �kid-friend-of-the-cast review�, I will mention a few things that could have been better. Michael Austin has a wonderful voice, but many of the songs he sang are in a range where he can�t project well. Bite the bullet and mic him! The political undertones of the story are pointless. The story could just as easily have been about anything else, but �paying to pee� is a definite attention getter. I agree with the director�s notes in the program: it is a ��laugh-out-loud comedy. So don�t look for a lot of social relevance.� The theatre seats, while undoubtedly the most comfortable of any local community theatre, were predisposed to being in the �upright and locked� position. When I tried to stand for the curtain call, I had quite a struggle as the seat kept pulling my feet off the ground and trying to swallow me up instead of allowing me to get up and salute a great performance. In closing, I can easily understand why the run for this show has been extended and why it has been sold out every weekend. This one is very special. If you can get a ticket before it passes into memory, go see it. I�m still not a big fan of musicals, but I sure am of this production! 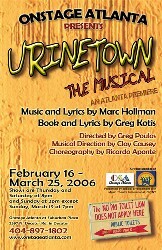 All week I had been hearing terrific reviews about Onstage Atlanta's Production of Urinetown. So, I was completely psyched when I hopped in my friends car to see it. Never having been to Onstage, I was quite surprised by the type of stage they had to work with. I was a tad bit skeptical. I shouldn't have been, but nevertheless I was. I seem to always be that way when I enter a theatre with a tiny stage. Then the show began. It was absolutely fantastic. The show begins with Officer Lockstock, played by Eric McNaughton, basically explaining what the show is about in a very comical and nudge nudge, wink wink sort of way. And with Little Sally, Jenna Edmonds, by his side they guide us throughout this "serio"-comic musical. But the most wonderful thing to watch on stage was the audience, by far. All of them were invested in the show throughout the ENTIRE show, which is so rare when it comes to most shows. A 0 means that it was bad, and by your review it sounds like you loved it, I just wanted to let you know. 5 is amazing 0 is horrible! Sorry, just thought you would like to know for future reviews!